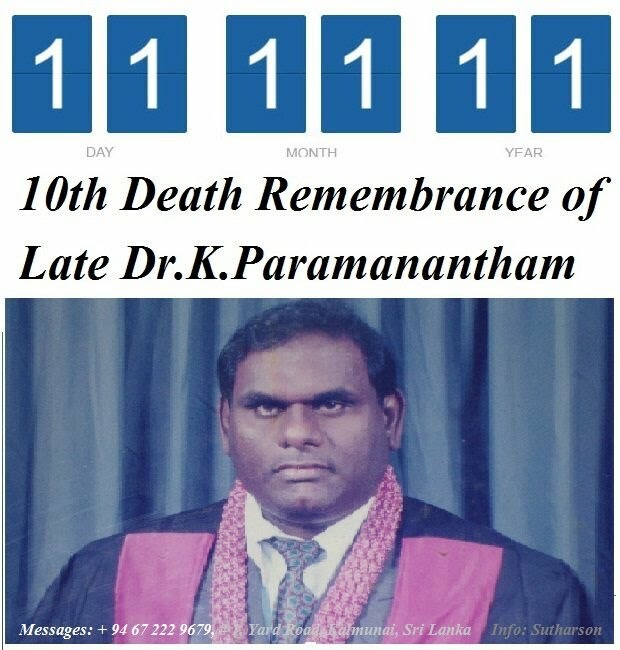 It was with deep sense of sorrow to learn the shocking news of the death of Dr. Paramanantham on the fateful day of 11.11.2001. As his name signifies he attained the eternal bliss by paying the debt of nature after a brief illness. He was affectionately called by his colleagues and friends as Dr. Param. He was born in the village of Karaithivu, as son to Mr. and late Mrs. Kanthiya, on 1955-11-09. Having completed his studies in Vipulanantha Central College of Karaitivu and in Sivanantha Vldhiyalaya Batticaloe, be was selected to follow the course of medicine. He emerged as an invaluable product of medical faculty of Jaffna with MBBS degree. He completed his diploma in family medicine a few years back. During his ephemeral life, he held the posts of senior medical officer, district medical officer, regional epidemiologist and deputy provincial director of health services of Trincomalee. In all these posts he has displayed great acumen and established an unbreakable record of hard work. His pleasant personality with pleasing smile was a real panacea for the ailments of his patients who sought treatment from him. He is very diligent and intelligent. Discipline and honesty were the hallmarks of his career. As district medical officer of base hospital, Kalmunai he left no stone unturned for the uplift of the hospital. He developed rapport with patients and the staff. During his tenure as DMO, the hospital saw many developments and attracted hundreds of patients seeking treatment every day. He established excellent and enviable reputation not only among patients but also the doctors worked with him. He worked tirelessly towards the development of the hospital. His name should be etched in golden letters in the history of this institution. He rendered a yeomen service not only to the patients but also to public of the Kalmunai area. He never failed to engage in social and religious activities despite his tight working schedule. He had everything that people long for, status, power and wealth. He made friends from all walks of life. The most striking features of Dr. Param were his charm and simplicity. He was a dutiful husband and devoted father. He was the be all and end all and a world to his wife Kanthavanam Punithasvery to whom it is much difficult to bear his loss and there is no word to console and comfort his daughters Mahinthini, Shahithiya and Gayathiry on the demise of their beloved father. The wide circle of friends he made will miss him a lot and the void created by his death cannot be filled. His death is an irreparable loss to the entire communities of this area. The indelible great wealth of memories he has left behind will remain in the hearts and minds of patients, friends end people of Kalmunai region.